57051-CZ is rated 4.4 out of 5 by 24. Rated 5 out of 5 by CDLake from High quality for a reasonable price Product came as described. Very high quality for a reasonable price. Product was shipped quickly & arrived in great condition. Rated 1 out of 5 by heatherm from Water pressure is way too low I can't even use this shower head to wash my hair because the water pressure is so low. Do not buy unless you want a very frustrating shower experience. Rated 3 out of 5 by MIke K in Palm Springs from Great styling, but hand wash needs more pressure. We bought this hand shower in a set with the 6 function control valves, the Dryden shower head and the body washes. The hand shower head is plastic, which was a bit disappointing as it seems these should be metal, but the other parts are all metal. The hand shower hose is very good quality. The hand shower head seems to not have as good a pressure as I might like, it is more like a gentle shower head. Installer says everything was easy to install and clearly labeled in separate boxes. Looks very attractive when installed. Overall an B-. Hoping the plastic pieces hold up over time, but can always buy replacements if needed. I might like a more forceful (pressure wise) hand shower, but it still works well. Rated 5 out of 5 by Craven from Great Hand Shower Built a DIY 5x5 shower, needed a way to wash the shower walls and glass. I addition has proven a better way to bath the dog!. 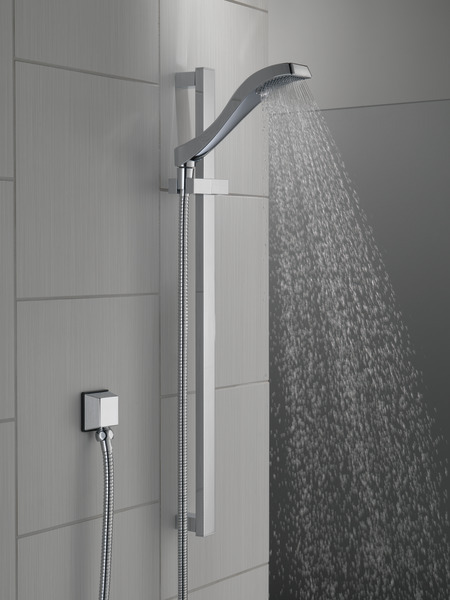 The shower height adjustment is smooth and locks in place when you put it there. In hindsight I would have mounted the water wall feed assembly lower to provide greater range of motion for the shower head High/Low. does the dryden hand shower wall bar also serve as a grab bar? Does this showerhead 57051-RB install as a Y connection to the main shower head or is it a separate wall mount? Thank you for your question. Delta Faucet model # 57051-RB can be installed two different ways. 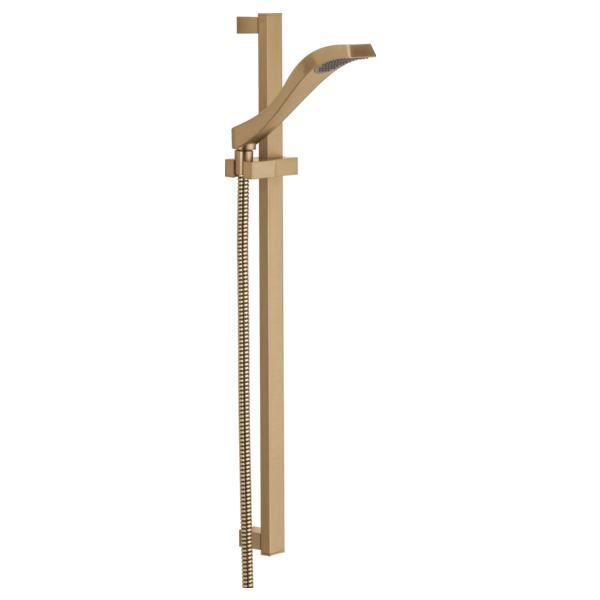 We have a shower arm diverter that is installed in between the shower arm and showerhead. 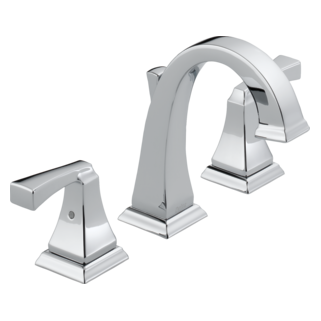 It is Delta Faucet model # 50650-RB. The other way to install this model is to get an in wall diverter. 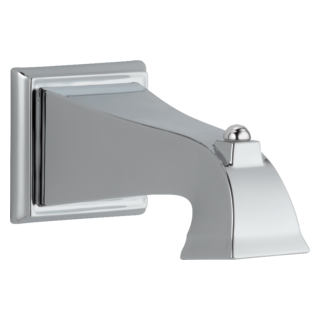 Delta Faucet model # R11000 is a diverter rough in. Then depending on what style shower you have, there is a matching trim for a 3 port diverter. 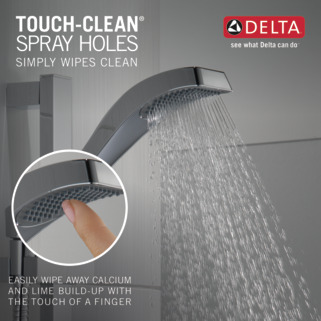 Dryden handshower work as a stand alone shower? Does this handheld on a slide bar work as the only shower head if we wanted to keep a small shower simple, or should it go with a mounted shower head? Will be for small tub shower enclosures, and want a slide bar for growing kids, but the head looks small, so wanted to know if it has sufficient spray to be the only shower head. Love the contemporary clean look, but need adequate spray. Thanks! Thank you for your question. The Dryden handshower emits 2.0 GPM (gallons per minute), which is comparable to a standard Delta Faucet shower head. I would like to put a regular shower head, T14251-S&amp;S, on one end of the shower and slide bar with hand shower on the other end. I prefer separate controls for each in case I only want water from one device at at time. On occasion I would like to use both devices so two people can shower at the same time. What do I need beyond T14251 and 57051 to accomplish this? Thank you for your question. 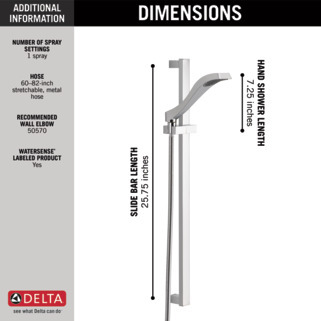 To join Delta Faucet model # T14251-SS and 57051-SS, you will need a diverter. We recommned the R11000 diverter valve with the T11851-SS diverter trim. 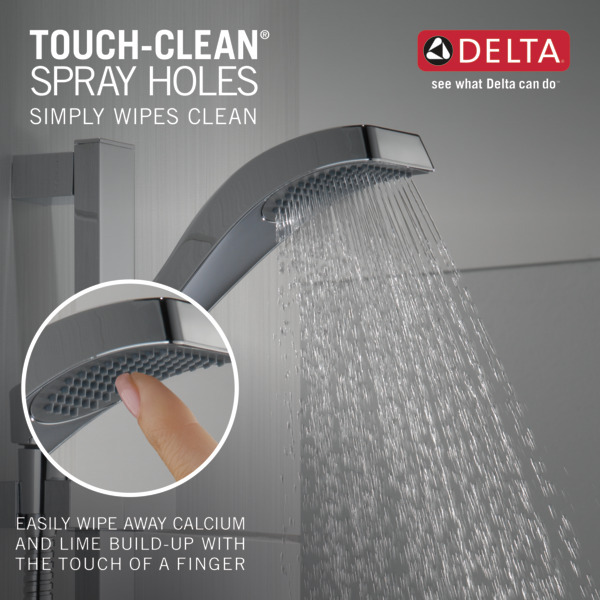 This will allow you to run the shower only, the hand shower only, or the two together. 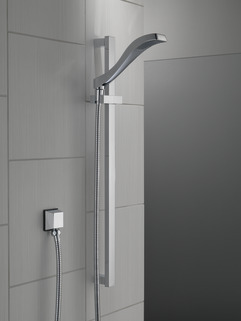 If you want separate controls for each one, then you will need two valves and T14051-SS to operate the handshower. We suggest using the R10000-UNBX rough-in valve. I need to (temporarily) replace my 5701 Dryden hand piece with (I understand) a flow rate of 1.75 gpm with a maximum flow rate 2.50 gpm or as close as possible. Please recommend the appropriate path forward, with a part number. Thank you! Is the showered metal or plastic? I am interested in the Dryden bathroom collection in the spotshield finish, however the handheld shower does not come in spotshield like the rest of the collection. Why??!! Which finish best matches spotshield? Stainless? Polished Nickel? 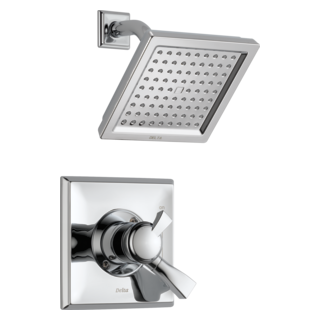 I am looking to install both 57051-SS (hand held shower and bar) and T17251-SS (shower head and control valve). I believe I also need a R1000-UNBX or R11000 valve as well as a U4929-PK 3-way to install on shower rod. Is there anything else needed?